Saints are more often associated with traditional sacred art than with contemporary work, but Michael Landy, current Rootstein Hopkins Associate Artist in residence at the National Gallery, has been inspired to revisit the subject for this exhibition. 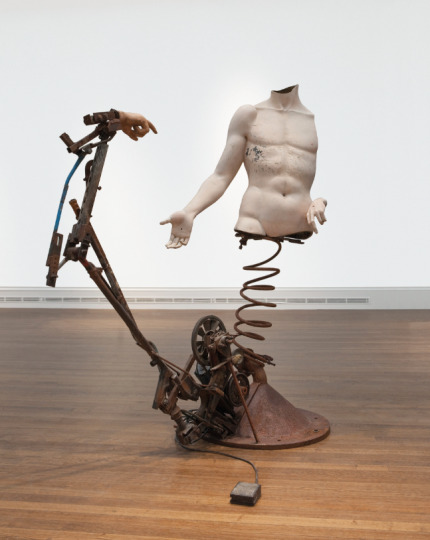 Landy’s large-scale sculptures consist of fragments of National Gallery paintings cast in three dimensions and assembled with one of his artistic hallmarks – refuse. He has scoured car boot sales and flea markets accumulating old machinery, cogs and wheels to construct the works. Visitors can crank the works into life with a foot pedal mechanism. Towering over you, the seven sculptures swivel and turn, in movements that evoke the drama of each saint’s life. Saints Apollonia, Catherine, Francis, Jerome, Thomas – and an additional sculpture that takes a number of saints as its inspiration – are exhibited alongside paper collages. The works by artists of the early Renaissance were particularly inspiring to Landy. Carlo Crivelli's Saint Jerome (about 1476), Lucas Cranach the Elder's Saints Genevieve and Apollonia (1506) and Sassetta's The Stigmatisation of Saint Francis (1437–44 and Cosimo Tura's Saint Jerome (probably about 1470), are all displayed in the National Gallery’s Sainsbury Wing.